What can we recover after a life passes on? A novel about love, forgetting and remembering. Pansy Lim, a Peranakan girl, was brought up in a seaside village in colonial Singapore in the 1940s. 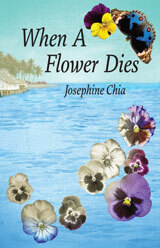 She inherits her mother’s love for flowers, nature, the sea, and their healing qualities. Educated by English nuns, she learns and grows to love English, literature and poetry. We see her at the start of the novel, aged, forgetful, and desperately clinging to memories of her recently deceased husband. Through her recollections, she remembers George Chan, the village life that they shared, and the communal past left behind by a nation always on the move.